All SharePoint intranets grow and change organically over time. Indeed, SharePoint is famous for encouraging sprawl and proliferation of team sites. However, the best SharePoint implementations change in a controlled and predictable way thanks to clear and practical governance. Because we manage and support intranets for many of our clients - often for the long term - we get to see first hand what works and what doesn’t from a governance point of view. In fact, for some clients we sit on their intranet governance boards. This unique experience means we can consult broadly and help you shape and define your SharePoint governance to suit your organisation, your culture and your people. We can do this either as part of your intranet build project or as a standalone project. Governance investigation research so that we can identify cultural, technology and organisational barriers and suggest practical work-arounds. Intranet governance workshops with stakeholders and senior managers to design a framework for your company and gain buy-in. Concise and digestible governance documentation and tools that people will actually use across all levels of the organisation. Design of self-service or classroom training content and build support models for admins, authors, end-users. Delivery of SharePoint support and hand-holding for end-users, either over the phone, email or face-to-face. Delivery of classroom and webex SharePoint training. User adoption strategy, promotional materials and campaigns. The corporate landscape is littered with SharePoint implementations that have spiralled out of control because governance was not considered up-front. 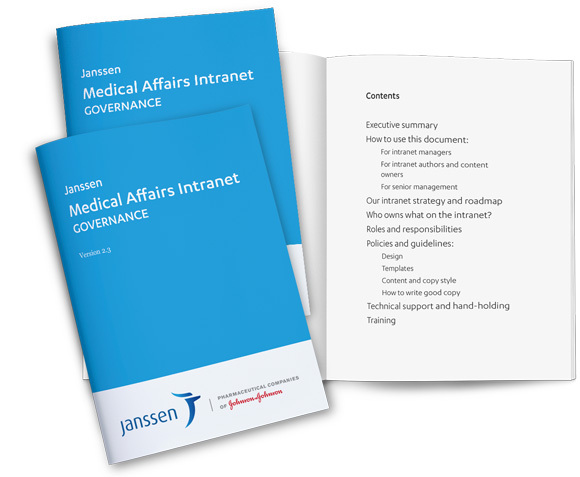 Thanks to our unique insights gained managing intranets in real-life businesses we know what good governance looks like and will help you avoid the pitfalls.